It has been WAY too long since my last post and all I can say is I'm sorry and WOW! September sure did fly by! I can't believe tomorrow is already October. I have been so busy at school and at home-- blogging just hasn't been a top priority. But, to make up for it I have some free stuff! Below are some of the resources that I have used for either math tubs or the math notebook recently. Click on the pictures to download. 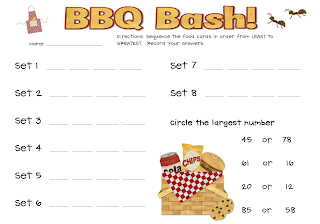 A math tub activity to practice ordering numbers from least to greatest. The directions aren't on the document. You will need to cut apart the food cards. Have the children sort the cards by the color around the outside of each card. Then, they will order the four cards in the set from least to greatest. Lastly, they will record their answers on the recording sheet. A class graph for the math notebook. We do the graph together as a class. I go around the room and allow each child to answer the question. 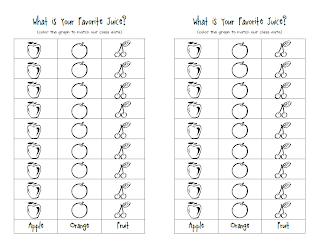 For this graph, the children colored in the fruit pictures as we we polled each child. ﻿﻿﻿﻿I promise I don't spend the whole day teaching math. I'm just excited to be teaching our new curriculum this year. Our reading time is a little more dictated by the basal (Harcourt Storytown), so it's not as much fun to blog about. 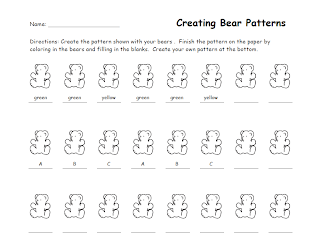 I also haven't spent much time creating word work activities because I've found so many great ideas on other blogs (why re-invent the wheel?). I hope you enjoy the free downloads. I'm going to try and get back into the blogging groove. It's neat to see you keeping your priorities right:) And these printables....AMAZING, as usual! Thanks for sharing! Thank you for sharing your talent!! 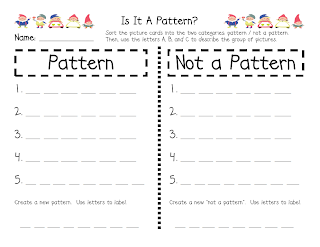 I appreciate the ordering numbers activity so VERY much because we assess it ever trimester and our Math doesn't hit it enough. This will be a tremendous help and also very fun for the kids! I love your cute little blog, so I've decided to give you the Versatile Blogger Award. Check it out! Thank you for sharing these wonderful *freebies* and for visting my blog! I now follow you!